Take your table tennis skills and family competition beyond the game room with Killerspin’s MyT-Outdoortable tennis table that can be ready to play on within 15-minutes of opening the box. 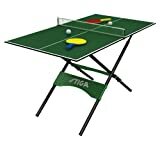 This foldable table was designed with outdoor use in mind and his wide range of features and excellent quality allows you to play your family ping pong tournaments in almost any weather you are willing to endure! Tough enough to withstand the elements, the MyT-Outdoor table tennis table also stands up to play your spin within any home game room.